The big box of fragrant navel oranges arrived just before the weekend. I opened it and looked down. Each orange was individually wrapped in tissue paper like a special gift. I grabbed one, washed and peeled it and started popping brightly colored pieces into my mouth. Delicious. These beautiful, orange fruits have become my daily indulgence ever since: oranges with yogurt for breakfast, oranges for an afternoon snack, and thinly sliced oranges in a salad of baby greens with Balsamic Vinaigrette at dinner (from the Gluten-Free Good Health Cookbook and Foodphilosopher.com). The fresh sweet taste and tropical color is a welcome respite from the grays and browns of winter in the northeast. After few days I started day thinking about all the orange rind going to waste. I thought about making the Orange Bread from Gluten-Free Baking Classics. It uses the rind of one whole orange and it is a cold weather favorite in my house, especially for sous chef boy. But then I started thinking about what else I could make. Cookies maybe? And somehow my thoughts turned to biscotti, specifically orange walnut biscotti. It just seemed to make sense. A couple of trial batches later- perfection. Delectable. Crunchy. Fragrant. 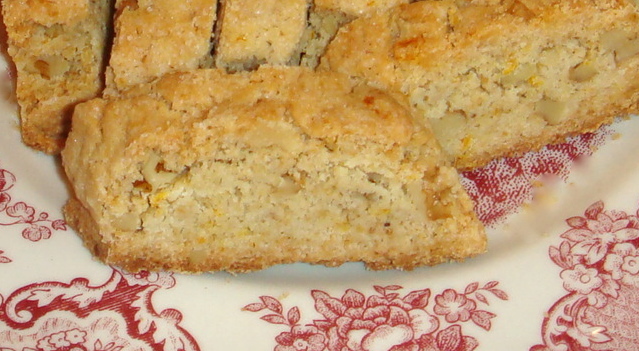 Gluten-free orange walnut biscotti. Perfect with my morning coffee. Perfect for an afternoon treat with a cup of tea. And perfect to serve with dessert wine this weekend when I have friends for dinner. So if you are brightening up your winter days with a pile of oranges, make sure to grab a zester and grate yourself a mound of rind to make this special recipe. You’ll be glad you did. Preheat oven to 325ºF. Lightly grease a large cookie sheet with cooking spray and dust with rice flour. Combine flour, sugar, baking powder, xanthan gum and orange zest in large bowl of electric mixer. Add eggs, oil, orange extract, and vanilla; beat at medium speed until well combined. Mix in walnuts. Dough will be very sticky. Use a spatula and floured hands to shape dough into three logs, each measuring 8 x 2 inches and 1 inch high, on prepared cookie sheet. Place logs 2 1⁄2 inches apart on cookie sheet. Place in center of oven and bake 30 minutes, until light golden. Logs will spread and flatten slightly. Remove to a cutting board and cool 8 minutes. Using a serrated knife, cut logs on the diagonal into 1/2 – 3/4 inch wide slices. Place biscotti back on cookie sheet, standing up, and return to oven. Bake about another 25 minutes, until light golden brown. Remove from oven and cool completely on a rack. Store in an airtight container. After three days, store in refrigerator. Can be kept in refrigerator for three weeks or frozen for up to six weeks. * Find my Brown flour mix in the Guide to Flour Mix section of this blog. I just want to say thank you. As a self described baking guru, who NEVER bought any pre made baked goods for her children, having my oldest diagnosed with celiac was VERY hard for her. With your recipes I have been able to show her that celiac doesn’t mean never having baked goods that actually taste good. I bet no one could tell the difference between wheat pop overs and the ones in your book. Thank you for making my 21 year olds diagnosis easier. I just sent her back to school with chocolate chip cookies and dough, brownies, muffins and a loaf of bread. Thank you for a your very kind comments and for letting me know that my recipes are helping your family. I really understand how important it is to be able to make your children feel comfortable with the diagnosis. My son was 12 when he was diagnosed (1 1/2 years after I was) and I think it was especially hard on him because of his age (and all those pizza parties after sports were heartbreaking for me to watch). It also helped to keep me on track trying to recreate his favorites. So please let me know if you ever need help converting one of your daughter’s. I’m so stuffed I can hardly move! My biscotti doesn’t look as pretty as yours but the taste is excellent. My logs crumbled a bit transferring them to slice. Thanks for a great new recipe. So glad you enjoyed them. Bet it doesn’t really matter how pretty they are once you bit into them. I’ve been very slowing eating my last batch which I have kept well hidden in the freezer behind a container of homemade bread crumbs. Tuck some away for a rainy day!! Lovely recipe and hope to try it out, but why a serrated blade rather than a very sharp, smooth blade to cut the cookies before second baking? Also, have you though of refridgerating the dough for an hour before shaping and baking to make it easier to work with? I used the serrated knife because it was easier for me to saw through the dough without breaking it. But by all means, use whatever works best for you. I actually never considered chilling in order to shape it because I just dusted my hands with the rice flour and got it done in a big, slightly messy flurry of activity. But, as I think more about it, if you did chill it, it would probably take longer to bake on the inside and then maybe dry out more/too much on the outside. Not really sure. Is this how you typically make biscotti? It’s how I typically work with sticky cookie dough. The trouble is the thickness of the dough and cooking time as you say. I would prefer to chill so I guess I would take the time for the dough to come to room temperature before putting in the oven if I had the time. I will try both ways and let you know! Great! I look forward to hearing back from you! 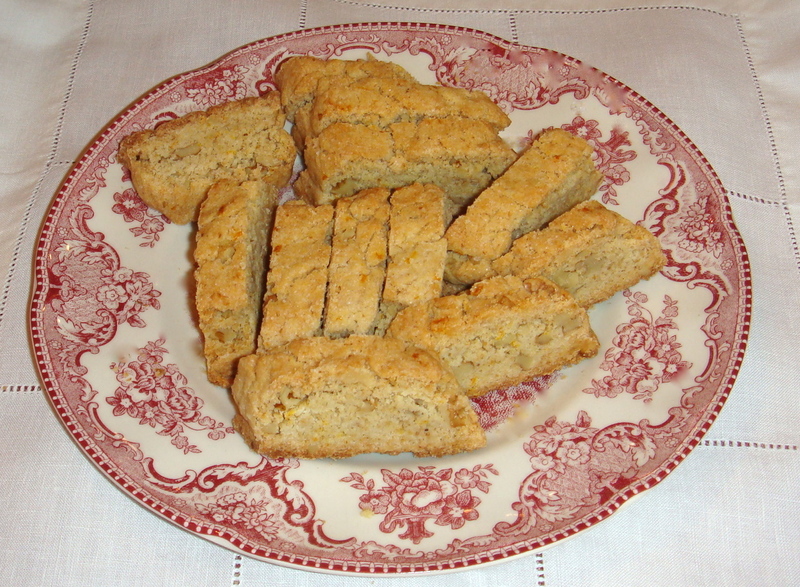 I have made your biscotti recipes from your Baking Classics cookbook. I have to say they do tend to be kinda crumbly. I use the crumbs for topping ice cream but the last batch was 80% crumbs. Any ideas on how to keep them from breaking up during the slice the log up and bake again step? Love love love your Baking Classics cookbook; I make many muffins from it; created a blueberry/pomegranate/walnut version and I only use your pie crusts; the traditional and the cookie crumb. Best. GF. pie. crust. ever! I’m so glad you are enjoying my recipes! And I love the blueberry/pomegranate/walnut idea. Must be beautiful to look and delicious to eat! As for your biscotti being more crumbly than they should be, there are several things we can consider. First, if you aren’t using finely ground rice flour, the cookies might need a little more moisture (at least 1 tablespoon, and maybe a bit more). A large grind absorbs more liquid. Second, the color and thickness of your pans could be causing the biscotti to bake faster. I use medium weight, shiny, sliver pans. If your pans are too thin or too dark, that could effect the bake time. And third, it might be simply that you may just need to bake them less (due to your pans, or ovens, or dryness of flour, etc.). If it were me, Id try reducing the bake time to 30 minutes them for the first bake and then slice and bake again. Please let me know how you make out and if you have any other questions!